Dimension Films has revealed the full theatrical trailer for Apollo 18, the found footage horror/sci-fi hybrid directed by Gonzalo López-Gallego that opens September 2nd. The trailer does bear high resemblance to Paranormal Activity bordering on verbatim. 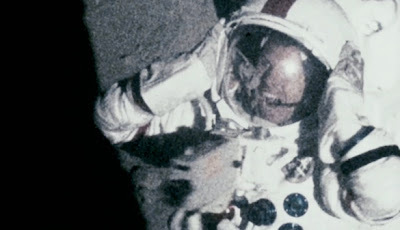 Produced by Timur Bekmambetov the story revolves around archived footage that reveals the U.S. launched one last secret mission to the moon before the Apollo program was terminated. While NASA denies its authenticity, others say it’s the real reason we’ve never gone back to the moon. Well its not but now I am too scared to look at the damn thing [moon]. Hit the jump to check out the trailer. I'm reading: "You'll Kill Us Both!" The Full Theatrical Trailer for 'APOLLO 18' Has LandedTweet this!